Why were so many women dying at this one hospital? In 1846, Vienna had one hospital, but the hospital had two maternity clinics. The procedures in both clinics were the same, yet one in ten of the women admitted into one of the clinics didn’t come out. She died. Word got out. Because the hospital had a practice of admitting women on alternate days, women would beg not to be admitted to the one clinic with the infamous reputation. Most of these women were prostitutes and poor, and many of them chose to give birth in the street rather than risk their lives in the clinic. Interesting thing. Even the women giving birth in the middle of the street had a better mortality rate than those going into the maternity clinic. 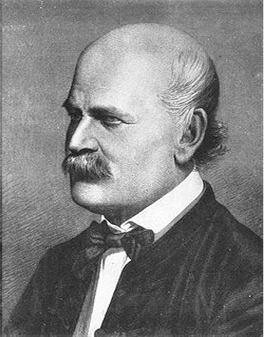 Enter Dr. Ignaz Semmelweis . He had recently become the 19th-century version of a chief resident at this hospital. Women were dying in his hospital of puerperal fever, and he wanted to know why. The good clinic was staffed by midwives. The clinic with the bad reputation was run by medical students. Both clinics followed the exact same procedures, but Semmelweis found one difference. When the medical students weren’t delivering babies, they were studying. And studying meant studying the human body. In other words, they were up to their elbows in corpses. Get the picture? There’s the budding wannabe doctor with his hands in some cadaver’s insides when he gets the call to go deliver a baby. So he rushes off. We can’t fathom that today. In our culture of hand sanitizer bottles in our cars and purses, we can’t imagine not washing our hands. Even Waffle House expects their employees to wash their hands before slinging hashbrowns. But this was the 1840s. No one even remotely connected germs and disease with what might be on our hands. Until Dr. Semmelweis made the connection. So he instructed the medical students to wash up before entering the delivery room. The death rate of the mothers went down. Way down. Dr. Semmelweis published his findings with the simple conclusion that doctors should wash their hands. And the medical profession stood up with one voice—and laughed at him. Such a simple idea, but doctors thought it was nuts. And they thought Semmelweis was nuts for suggesting it. What’s worse, they eventually drove Semmelweis nuts. Dr. Semmelweis persisted with his simple message—WASH YOUR HANDS—and the opposition persisted in laughing at him. The struggle took its toll, and he was admitted into an insane asylum. He died 14 days later. Too bad Dr. Semmelweis was locked away and never heard what happened. On August 12, 1865, one day before Semmelweis died, one doctor took him seriously. Dr. Jospeh Lister began using antiseptic practices in the operating room. Lister proved Semmelweis right, and death from post-operation infections dropped from 50 percent to 15 percent. Standing on Semmelweis ‘ shoulders, Dr. Lister became the father of antiseptic surgery. Few people today know who Ignaz Semmelweis was. But Joseph Lister was celebrated a few years later by a chemist, and you pay homage to him every time you gargle. Semmelweis persisted with his message, and it was finally heard. When you know the right thing to do or when God has given you a task to do, keep at it regardless of the opposition. That’s what Nehemiah did. He was charged with rebuilding the wall of Jerusalem, and he kept at it in the face of his detractors. His persistence paid off in 52 days. When you persist in doing the right thing, you may see the fruit in 52 days or you may never see the fruit in your lifetime. But there is fruit to your work. Persist. Keep at it. “Therefore, my dear brothers and sisters, stand firm. Let nothing move you. Always give yourselves fully to the work of the Lord, because you know that your labor in the Lord is not in vain” (1 Cor. 15:58). For a printable version: click here. This post supports the study “Persist” in Bible Studies for Life. To subscribe to this blog, click on the SUBSCRIBE button at the top of the page. Sign up with only your email address. It’s never sold or given out. Previous Previous post: Is God’s Standard Just for Christians?